Subscribe today and save up to 64%*, plus get free access to the iPad and iPhone editions. Creating a profile allows you to sign into the app to read each issue. Please enter at least 8 characters when creating a password. *Savings based on U.S. prices and on $360.00 U.S. two year cover price. 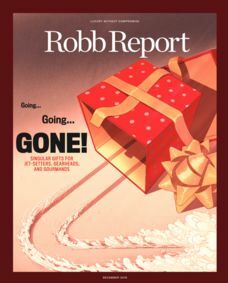 An annual term to Robb Report is currently 12 issues, which is subject to change at any time.